Martha Hiwa is a physically challenged woman from Kalembo village in Balaka District. She did not finish Primary School. She is married in a polygamous marriage and spends most of her time on her own, as she says her husband prefers his other wife. In the past, Martha was food insecure and lacked basic household essentials. She was excluded from development programmes on the basis of her being physically challenged. Under Self Help Africa initiatives in Kalembo Impact Area, Martha received 3 goats (2 does and 1 buck) in 2007 after the Village Development Committee learnt in one of the trainings that women empowerment, joint decision making on equal access and control of resources amongst males and females in families, reduces gender based violence in communities. To date she has 6 goats of her own, something she never envisioned she would possess. She has been able to construct a good house and user friendly toilet as she could not access the available toilets due to walking difficulties. 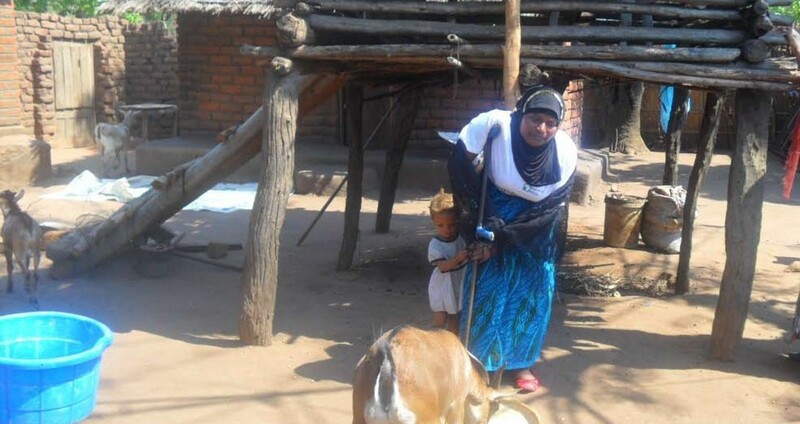 She was quoted as saying “I did not know that I can own my own livestock in this life, thanks to Self Help Africa”. She is a now a role model in her village, proving to the community that “disability is not inability”.